Michael Sinterniklaas is a veteran of the anime industry and has worked as a ADR Director, actor, voice actor, script writer, sound engineer, mixer and producer. In 1999, Michael founded NYAV Post, a bicoastal recording studio that has worked on over 500 anime and non-anime titles. Michael is a prolific actor and has voiced countless roles in anime such as Dagger in Black Butler: Book of Circus, Netherlands in Hetalia, Xellos in Slayers Revolution and Evolution-R, Gasud in Jormungand, Kenji in Summer Wars, Jessie's Seviper, Joshua and Kennedy in Pokémon, Lucemon in Digimon, Ivan Karelin, Dark Magician and Mahad in YuGiOh, Origami Cyclone in Tiger & Bunny, Sarutobi Sasuke in Sengoku Basara, Sora and Utakata in Naruto, Jared / Jess in Speed Racer: The Next Generation, Luppi / Nnoitra Jiruga in Bleach, Angelo in Gundam: Unicorn, Age in Patema Inverted, Masakazu Masaki in Time of Eve, and Takeru in FREEDOM. But that's just the tip of the iceberg! Outside of anime, he is also well known as the voice of Dean Venture in The Venture Bros, Leonardo in Teenage Mutant Ninja Turtles (2003), Mikey Simon in Kappa Mikey, Nathaniel / The Evillustrator in Miraculous Ladybug and even Funshine in The Care Bears. He has also appeared in video games such as Final Fantasy XIII, Excom, GTA V, the Lego Movie Game, Xenoblade and is the lead Yew Geneolgia in Bravley Second to name a few. 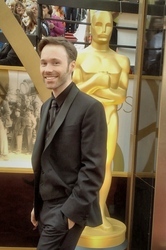 As a director, Michael has worked on many anime, American series and feature releases. Anime include: Mobile Suit Gundam Unicorn, Berserk, Magic Users Club, Ah! My Goddess, Samurai Deeper Kyo, Slayers Revolution, Slayers Evolution-R, and Giant Robo, and the recent video game release of Just Cause 3. He's also directed several non-anime shows and movies including the recently released Phantom Boy, Peter Rabbit, Super Friends, Robotomy, and the Oscar nominated movies A Cat in Paris starring Anjelica Huston, Marcia Gay Harden, and Matthew Modine, as well as Ernest and Celestine starring Forest Whitaker, Lauren Bacall, Paul Giamatti, William H. Macy, Megan Mullally, Nick Offerman, Jeffrey Wright and McKenzie Foy. When he's not busy at work, Michael enjoys photography, guitars, synthesizers, and Doctor Who, with Tom Baker's Fourth Doctor being his favorite regeneration.